You might be thinking, “Hey, you already told me about this Witching Hour game!”. And you’d be wrong. You’re probably thinking of our feature of a game with a similar name, Approaching Dawn: The Witching Hour. Other than a couple matching words, Witching Hour by Indie Boards & Cards is a completely different animal. The former is a cooperative game where you work together to survive the night. 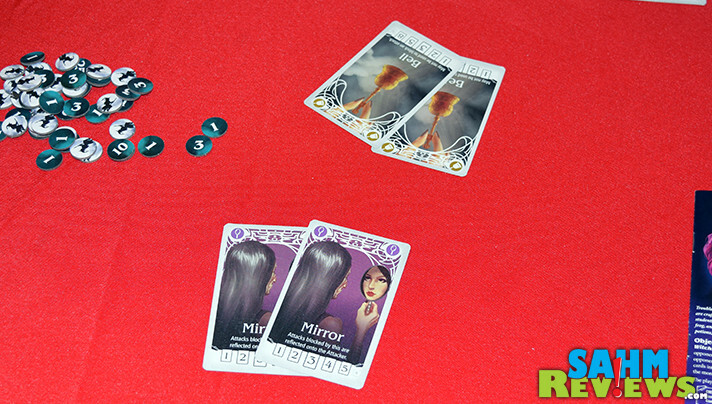 The latter is a unique twist on a traditional trick-taking card game! You know how in most trick-taking games you try to win a hand and then count up how many you’ve collected over the round? That’s not what you do in Witching Hour. 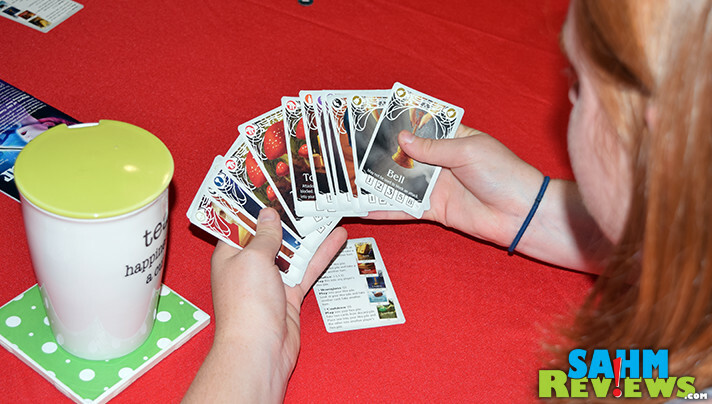 In fact, you really don’t want to win any tricks or collect cards – you want them all stuck on your opponents! 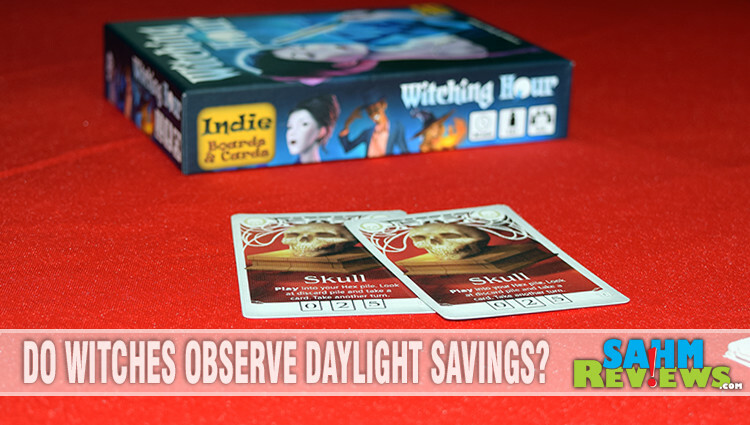 The object of Witching Hour is to play over three rounds and be the person with the lowest total score! And speaking of score, the methodology utilized is taken directly from modern hobby games – something new for this type of card game! 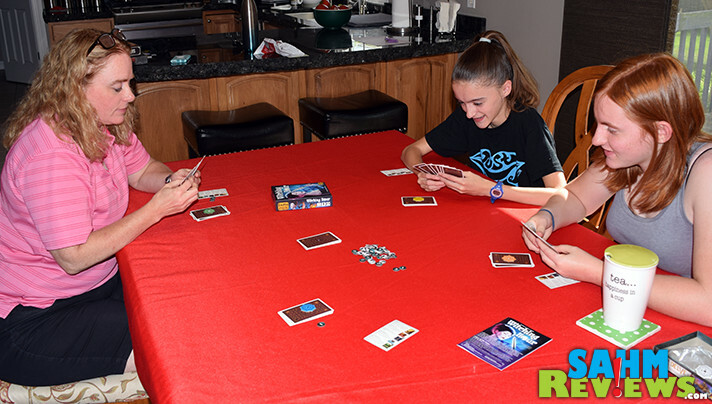 Supporting up to five players, each person is dealt a hand of 13 cards (10 if playing with the full compliment of five), with the rest of the deck being set in the center of the play area to act as a discard pile. 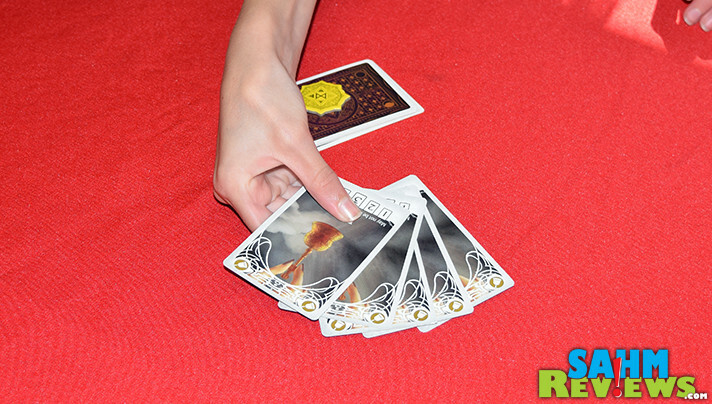 On your turn you will play any set of matching cards from your hand to challenge another player, as long as they still have cards in their hand. This is your “attack” and unless the other person can defend themselves by playing any set and matching the number of cards attacked with, they will add your attack cards to their personal Hex pile. 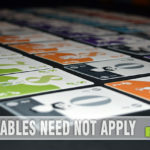 If they can defend themselves with a set, all cards are discarded into the center of the table. Instead of attacking, you may opt to utilize the alternate “play” ability on each card. These will range from taking cards from the discard pile, peeking at your opponent’s hand, swapping out cards from your Hex pile or even using a Familiar card to completely block any attack (except for Toadstools, which are immune). Sounds simple so far, right? That’s the elegance of Witching Hour – it doesn’t take long to get up and running since the rules are clean and quick. As I previously mentioned, the scoring is a bit different though. Instead of just counting up the cards you have and assigning them one point each, cards are worth more if you possess more of them. Much like the bonuses you see when you collect sets in games like Herbaceous or Virulence, but instead they count against you in Witching Hour. For instance, if you have only one Book Card in your Hex pile at the end of a round, it doesn’t add any points to your total. However, if you have two copies, then it costs you three points! And heaven forbid you get stuck with three Books – that will set you back seven points! Some cards, like the Chalice, actually reward you with negative points if you only have one, but quickly penalize you the minute you get your second version by costing you a point overall. 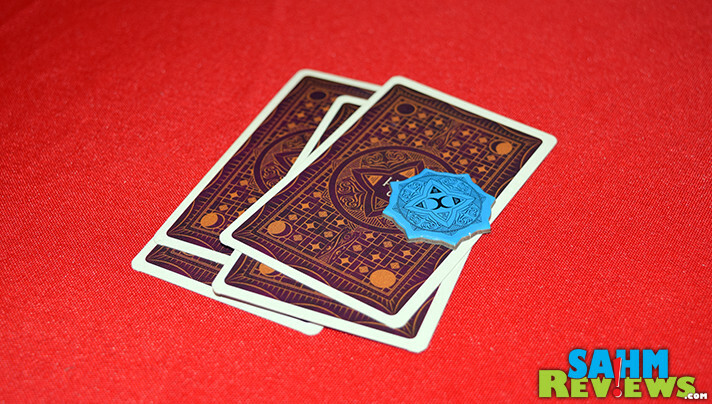 Players take turns either attacking or playing one card until all participants, except one, have run out of cards. The person with remaining cards puts them all into their own Hex pile and scores are tallied. 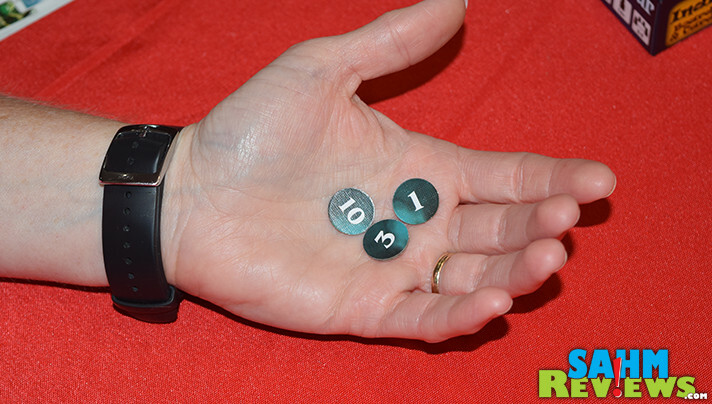 Take the included tokens matching your score and reshuffle all the cards and deal them out for the next round! Three entire rounds are played in the exact same manner, with the person possessing the lowest overall total winning Witching Hour! 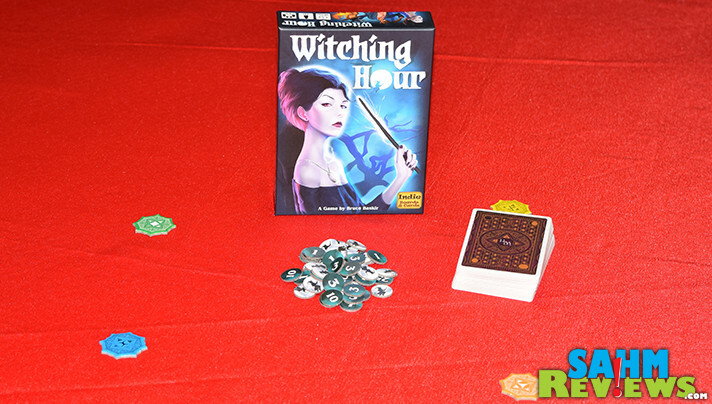 A bewitching twist on the trick-taking genre, Witching Hour can be found on Amazon for under $12 shipped or at your local game store. You’re probably already familiar with Indie Boards & Cards thanks to their ever-popular Coup and The Resistance game lines. But they also have a vast library of other games to consider, so check out their website as well their Facebook and Twitter timelines to learn more! Have you played any witch-themed games? Yep, that announcement caught everyone off guard I believe. Sounds like they’ll run the companies independently, but I would expect each of them to pull from the other’s strengths. I love games that make it feel like it’s Halloween year round. 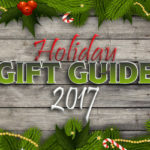 nice, I love the small box games indie cards and games puts out. The scoring sounds a bit complicated. This looks like a fun game. I need to get some more games in our collection. Thanks! The games looks fun to play with. Looks like a slightly spooky good time!